Livestock is a huge source of GHGs-so where are the ads telling us to eat less meat? With global warming now a household phrase, politicians and environmentalists are putting forward a cascade of strategies to deal with the crisis, but one message is conspicuously absent from the call to action: the recommendation to consume less meat. Canada is among the world's top three meat-consuming nations, and meat production takes a hefty toll on the environment. Last November, the Food and Agriculture Organization of the United Nations (FAO) reported on the environmental impact of meat production, noting that, "The livestock sector emerges as one of the top two or three most significant contributors to the most serious environmental problems." On a global scale, livestock production is responsible for 18 percent of the world's greenhouse gas (GHG) emissions, which is more than the transport sector. There has been a deluge of recent initiatives undertaken to abate global warming, including the Canadian government and environmentalists advocating fluorescent light bulbs, and Ontario turning up the thermostat to a balmy 26 degrees Celsius in government buildings during the summer months. Climate change was even front and centre at the most recent G8 meeting in June. But most environmental organizations fail to discuss meat production's environmental impacts, and few make this a major part of their global warming campaigns. So why, when Canadians are more interested than ever in living sustainably, are there no organized efforts to persuade them to cut back on meat? Environmentalists challenge conventions to create social change, but with just four percent of the Canadian population being vegetarian, vegetarianism is still viewed by some people as a fringe movement, one that environmentalists might be reluctant to associate themselves with, particularly when the green movement has made great strides penetrating the mainstream. It's also difficult to see the connection between eating meat and environmental problems. 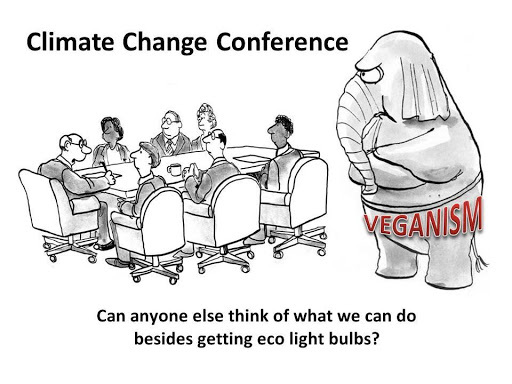 But consider this: GHG emissions resulting from the production of one kilogram of beef are equal to driving for three hours and leaving all the lights on at home for the same amount of time. With global meat production and consumption on the rise, it is vital that the green movement embrace the vegetarian message. Perhaps if Canadians were knowledgeable about the true cost of eating meat, they'd reduce their consumption of animal products in favour of a more earth-friendly diet. "Which is responsible for more global warming: your BMW or your Big Mac? Believe it or not, it's the burger. The international meat industry generates roughly 18% of the world's greenhouse-gas emissions - even more than transportation - according to a report last year from the U.N.'s Food and Agriculture Organization. Much of that comes from the nitrous oxide in manure and the methane that is, as the New York Times delicately put it, 'the natural result of bovine digestion'. Methane has a warming effect that is 23 times as great as that of carbon, while nitrous oxide is 296 times as great. There are 1.5 billion cattle and buffalo on the planet, along with 1.7 billion sheep and goats. Their populations are rising fast, especially in the developing world. Global meat production is expected to double between 2001 and 2050. Given the amount of energy consumed raising, shipping, and selling livestock, a thick T-bone is like a Hummer on a plate. If you switch to vegetarianism, you can shrink your carbon footprint by up to almost 1.4 tons of carbon dioxide a year, according to research by the University of Chicago. Trading a standard car for a hybrid cuts only about one ton - and isn't as tasty." Meat-free menus are to be promoted in hospitals as part of a strategy to cut global warming emissions across the National Health Service. The plan to offer patients menus that would have no meat option is part of a strategy to be published tomorrow that will cover proposals ranging from more phone-in GP surgeries to closing outpatient departments and instead asking surgeons to visit people at their local doctor's surgery. Some suggestions are likely to be controversial with patients' groups, especially attempts to curb meat eating and car use. Plans to reuse more equipment could raise concern about infection with superbugs such as MRSA. Dr David Pencheon, director of the NHS sustainable development unit, said the amount of NHS emissions meant it had to act to make cuts, and the changes would save money, which could be spent on better services for patients. "This is not just about doing things more efficiently, it's about doing things differently, because efficiency is not going to get us to big cuts," said Pencheon. "What will healthcare look like in 2030-2040 in a very low carbon society? It will not look anything like it looks now." Last year the NHS published what it believes is the biggest public sector analysis of carbon dioxide, the biggest greenhouse gas, which showed the organisation's emissions in 2004 were 18.6m tonnes and rising. This accounts for more than 3% of all emissions in England, and if the NHS was a country it would have been ranked as the 81st biggest polluter in the world that year, between Estonia and Bahrain. One-fifth of the emissions were from transport, one-fifth from buildings, and the remainder from procurement, including drugs, medical equipment and food. On Tuesday, Pencheon and the NHS chief executive, David Nicholson, will publish the strategy - Saving Carbon, Improving Health - which will set targets to cut the organisation's carbon footprint, and proposals to meet them. It follows a government pledge last year to cut greenhouse gas emissions by 80% by 2050. The plans cover all aspects of patients' care, from building design to transport, waste, food, water and energy use. Among the most talked-about is likely to be the suggestion that hospitals could cut carbon emissions from food and drink by offering fewer meat and dairy products. Last year, the United Nations climate chief, Rajendra Pachauri, provoked a global debate when he said having a meat-free day every week was the biggest single contribution people could make to curbing climate change in their personal lives, because of the chemicals sprayed on feed crops and the methane emitted by cattle and sheep. Last week, the German federal environment agency went further, advising people to eat meat only on special occasions. Pencheon said the move would cut the relatively high carbon emissions from rearing animals and poultry, and improve health. Last year the NHS served 129m main meals, costing £312m, according to Department of Health figures. "We should not expect to see meat on every menu," said Pencheon. "We'd like higher levels of fresh food, and probably higher levels of fresh fruit and veg, and more investment in a local economy." Other proposals that will impact directly on patients include urging people to drink less bottled water, more phone-in surgeries by GPs, greater sterilisation and reuse of equipment, and encouraging patients, visitors and staff to leave their car at home. Many ideas are already being pioneered by one or a few trusts but will be spread more widely, including automatic lights and taps, renewable energy such as biomass and wind turbines, and green travel plans - such as facilities for cycling or new bus routes and bus stations at hospitals. A blueprint for low-carbon buildings is also being considered, and longer term the NHS could develop its own energy grid supplied by renewables on its land. Staff will also be encouraged to work from home more often, incentives could be introduced for workers to use smaller-engined cars for business mileage, departments could be given their own energy bills with the offer that employees can keep a share of cost savings they make, and hospital pharmacies could hold lower stocks and courier in specialist drugs on demand to cut waste. The NHS will also use its massive purchasing power - £20bn a year - to persuade suppliers to cut emissions, and pharmaceutical companies will be asked to make drugs with a longer shelf-life to reduce the amount of out-of-date stocks. Longer term, to make bigger cuts, the NHS will have to make more radical changes, in particular giving more healthcare in or closer to patients' homes, said Pencheon. One idea being examined was for surgeons to travel to GP surgeries for follow-up consultations, to reduce the need for many patients to travel to outpatients departments, said Pencheon. "If you're going to get me radical I say the default place for health is in the home, and the person who delivers it is yourself: that's the ultimate low-carbon health service," he said. The report will argue that reducing carbon emissions will cut bills for equipment, medicines, energy, water and waste services, and improve health - in the short-term for example by encouraging people to walk, in the long-term by helping to reduce the impacts of climate change. "Unless we all take effective action now, millions of people around the world will suffer hunger, water shortages and coastal flooding as the climate changes," it says. "As one of the world's largest organisations, the NHS has a national and international imperative to act in order to make a real difference and to set an important example." Meat eaters are devastating our planet with their diet, due to the huge amount of farmland required to produce feed for animals, a new report has claimed. The World Wildlife Fund (WWF) says that the Western diet, with high levels of meat and dairy, is responsible for extinctions and biodiversity loss around the world. The WWF claims that 60% of all biodiversity loss worldwide is linked to the huge amount of feed such as soy, which animals require. The WWF says in its Appetite for Destruction report that a land area 1.5 times the size of the European Union could be reclaimed if people switched to a diet less reliant on animal products. ‘The world is consuming more animal protein than it needs and this is having a devastating effect on wildlife,’ said Duncan Williamson, WWF food policy manager.